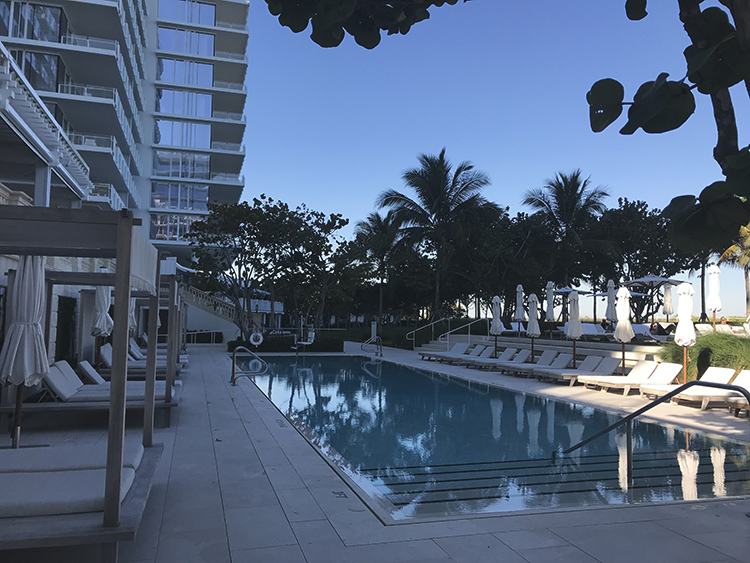 The slick, minimalist Richard Meier-designed Four Seasons Hotel & Residences, 9011 Collins Avenue, is invariably referred to as being in Miami Beach but is actually in Surfside, Dade County, closer to Bal Harbour than Miami Beach. From the now fashionable Mid-Beach the journey by car can take 25 minutes, especially in traffic if the lights are not on your side. 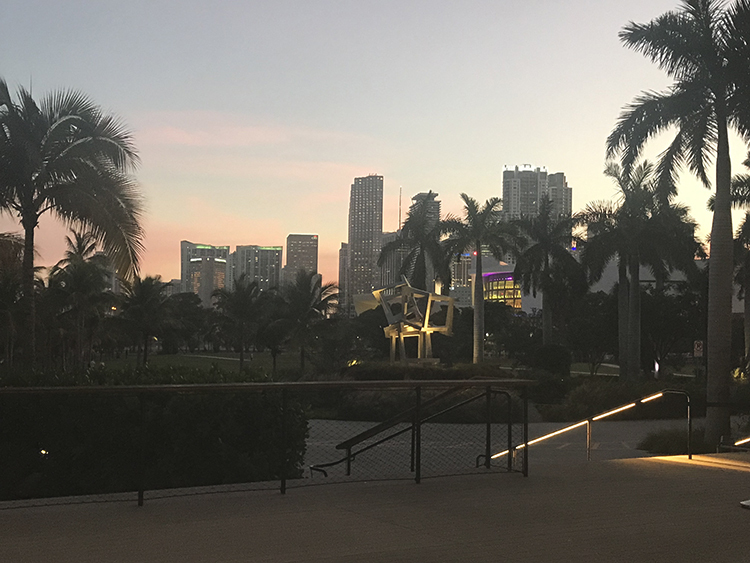 The drive from South Beach can add another 15 minutes. An easy-to-miss driveway bordered by a perfectly clipped hedge leads up to the discreet dark-wood entrance doors of the original Surf Club. An abundance of porters are waiting to welcome you into the property and provide directions. Inside the 1930s Mediterranean Revival-style building, a calm, spacious interior awaits you. 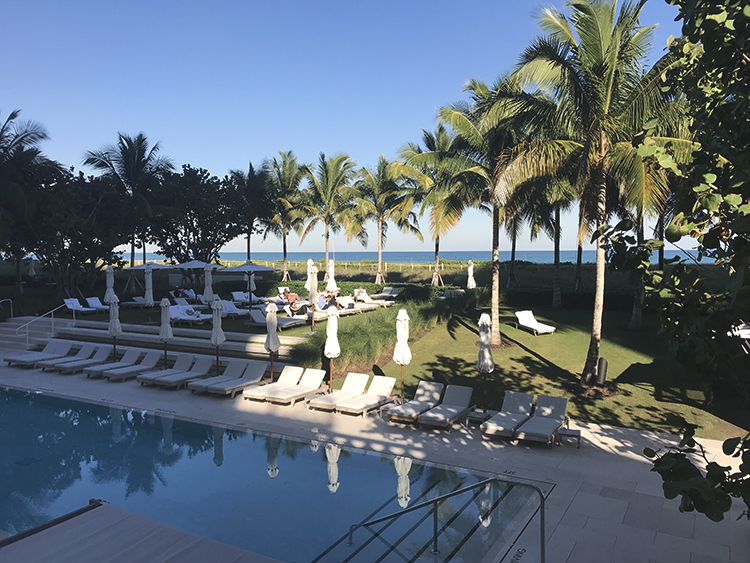 World-famous starchitect Richard Meier has skilfully incorporated the former home of the once celebrated Surf Club into an ultra-modern oceanfront complex comprising a 77-unit boutique hotel with condominium towers on either side. 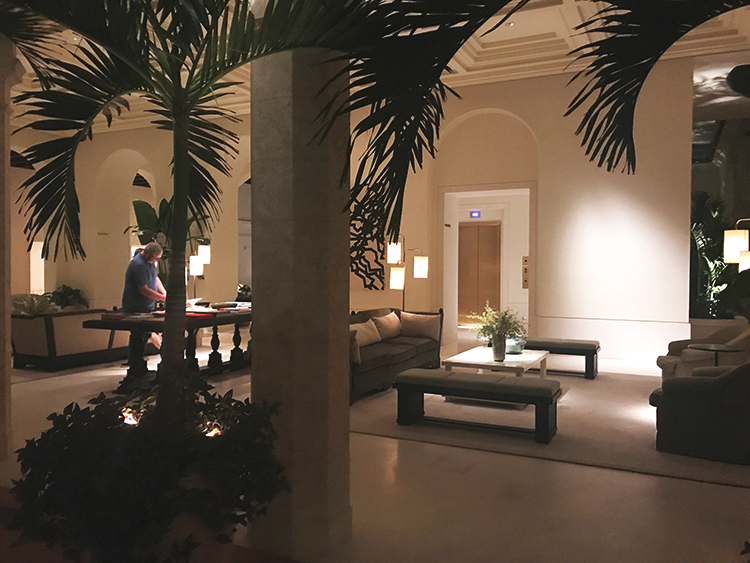 The wide terracotta-stone-floored hallway, with a hacienda-style hardwood ceiling, leads through soaring open archways into the opulent marble floored sitting and reception rooms and out to the pool and beach areas. The minimalist style in pale muted colours with lofty coffered ceilings, giant potted palms and designer lighting features sleek sofas and seating arrangements, beautiful coffee table books displayed on a dark wood refectory table, floor lamps and low benches. Two well-merchandised boutiques line one side of the hallway leading to the north tower. A reception area is positioned beyond the sitting space. 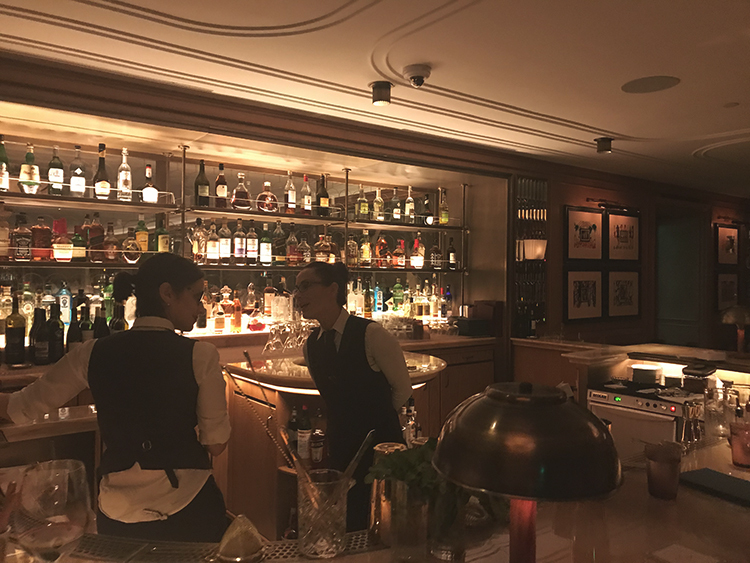 To the right of the entrance the recently opened wood-panelled Thomas Keller Champagne Bar has the retro style and ambience that reminds us a little of one of our favourites in LA, the Sunset Tower Bar. Come for a cocktail at the large bar counter or take a table booth and enjoy a light supper. 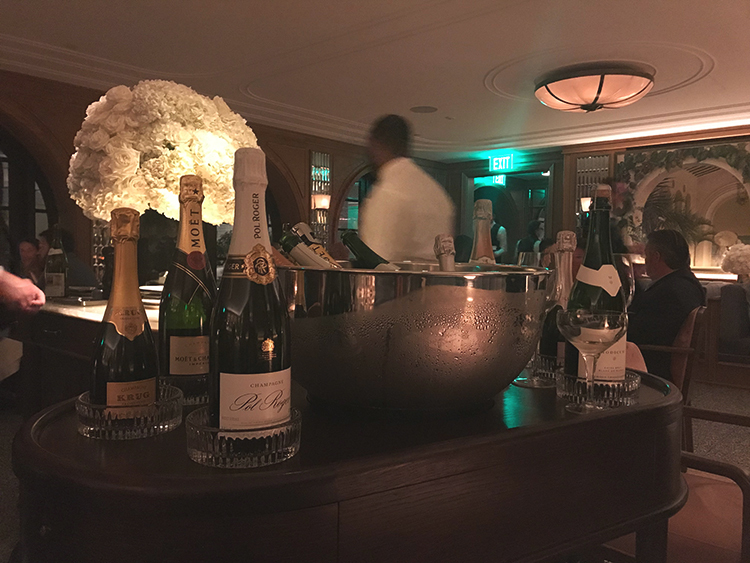 The Thomas Keller Restaurant beyond is more of a formal affair, polished, clubby, accomplished and exceedingly good in that city slick kind of way. We love the Champagne cart they bring before dinner, the highly professional female sommelier, the semi-boothed banquette seating arrangements. 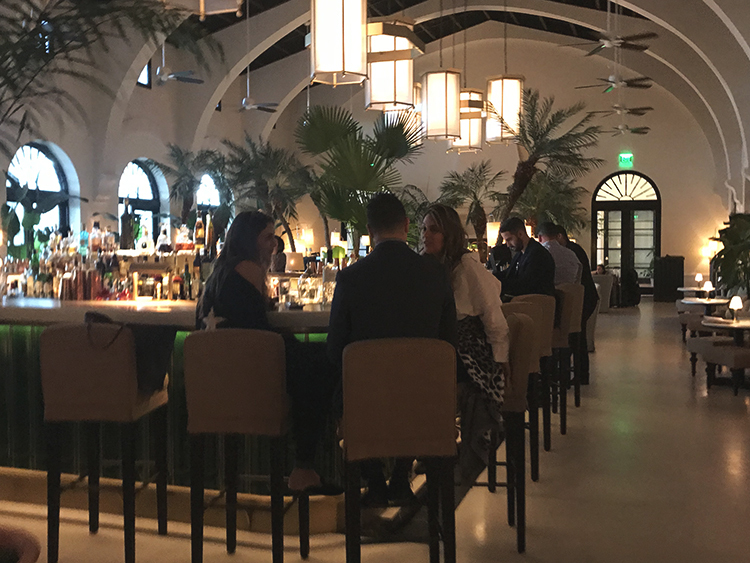 This is a restaurant where you might come dressed up for a more sophisticated dining experience when compared to most of Miami’s more trendy, casual venues. It’s what one might expect from an outpost of a world-class chef such as Thomas Keller of French Laundry fame. 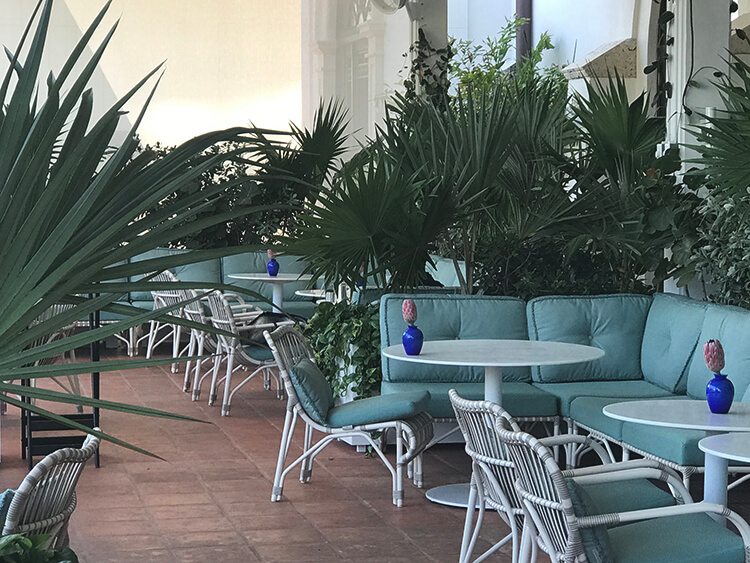 On the other side of the original club, beyond the sitting and reception areas, the impressive Le Sirenuse Bar doubles up as an all-day dining venue with an ocean-facing terrace leading off. 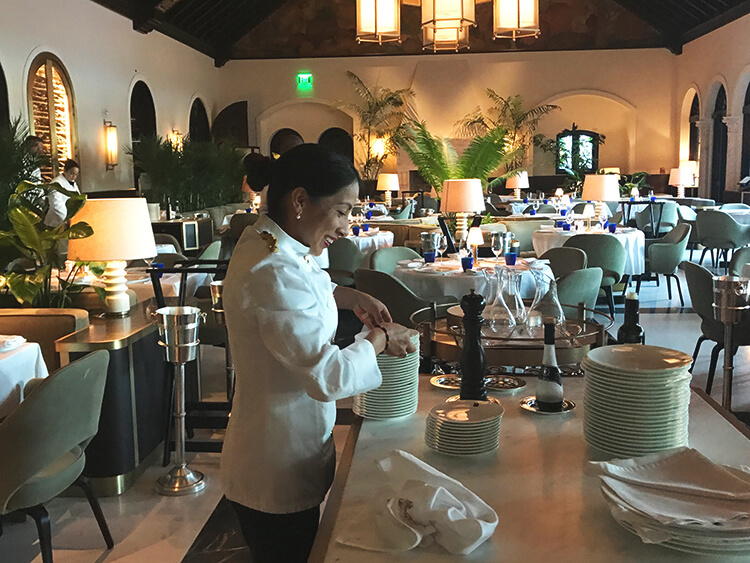 Breakfast and lunch are served here while the main Le Sirenuse restaurant, under head chef Antonio Mermolia, is reserved for night-time dining. After 3pm the lunch menu changes to a shorter bar menu, for example a tuna tartare or a pasta dish, which you can take inside or out on the patio above the pool. We were impressed with C’a del Bosco and some other good wines being served by the glass. Their home-made gelati is delicious and they make a good espresso. Our only gripe is that in winter the sun is lost by mid-afternoon and it gets quite chilly outside, so be forewarned. We had to ask for something warm and they brought us light wool blankets. The large marbled bar starts to fill up for cocktails around 5.30pm and stays buzzy all evening while the restaurant reaches full capacity around 8 o’clock. The ambience elegant in a slightly corporate way. An impressive spa, offering all the services and treatments you could wish for, completes the interior public facilities. 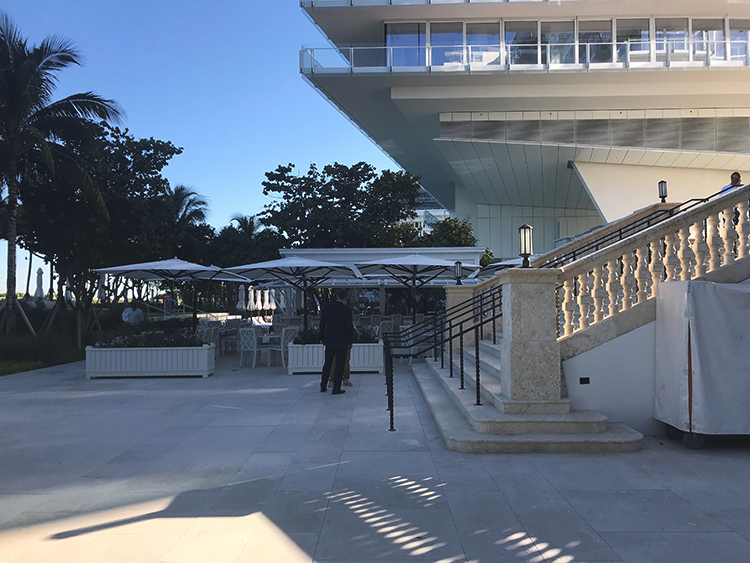 Guest accommodations in the 12-floor tower are well proportioned and flooded with light through floor-to-ceiling glazed French doors leading out onto enclosed glass balconies overlooking the Atlantic. The carefully chosen colour touches and textures are calm and restful. We like the subtle use of marble and wood, the white accordion-ridged wall finishes, the all-white king-sized beds with accents of pale green in the velvet-upholstered bases, and the pale cream of the day beds in the corner windows. Sumptuous bathrooms are lined in pale grey-veined marble slab with twin vanities and rainfall shower enclosures. 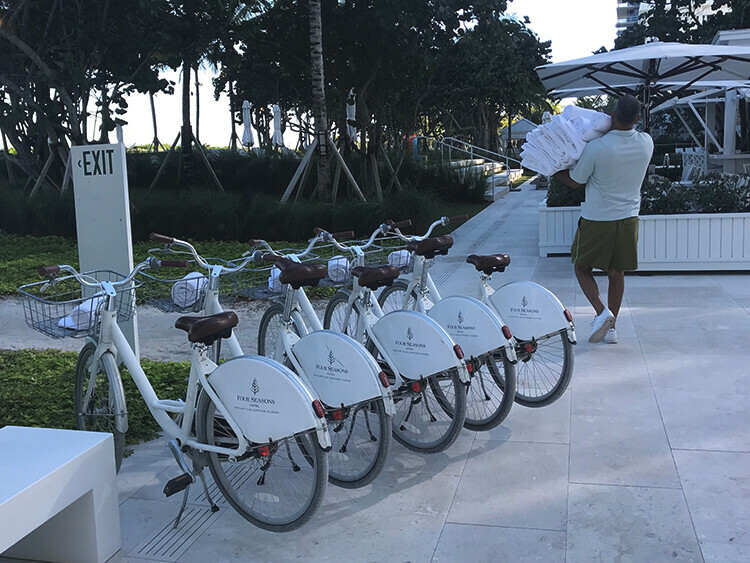 Up-to-the-minute gizmos and gadgetry are incorporated everywhere and service is everything you would expect from a great hotel brand such as Four Seasons. So far, this venue is excellent and impressive in almost every respect. And then it starts to underwhelm. When you leave the building, full of anticipation of finding a ‘wow’ beach and pool set-up it somehow falls flat. Everything is too new, rather cold and clinical and with the feeling of an add-on facility for a condominium development rather than the USP of a world-class resort hotel, especially as it is overshadowed by the tall condos on either side. There are three swimming pools; the main one for the hotel has a pool restaurant and sun-lounging areas with four-poster cabanas. A grass-floored raised deck between pool and boardwalk provides somewhere to get that last hour of sun when the pool has lost it by early afternoon, which, as we mentioned above, it does in winter. We found this a major disadvantage. When we were swimming and lunching just before 3pm it was in full shade and too cold to remain. Most guests must have reached the same conclusion, as the pool restaurant was invariably empty and therefore lacking any atmosphere. A slightly longer day of sun may be had at the beach, which is narrower here than at Mid-Beach, with the dunes behind it. It is comfortably set up with sun-loungers and beach attendants, but you need to return to the main hotel complex for lunch. 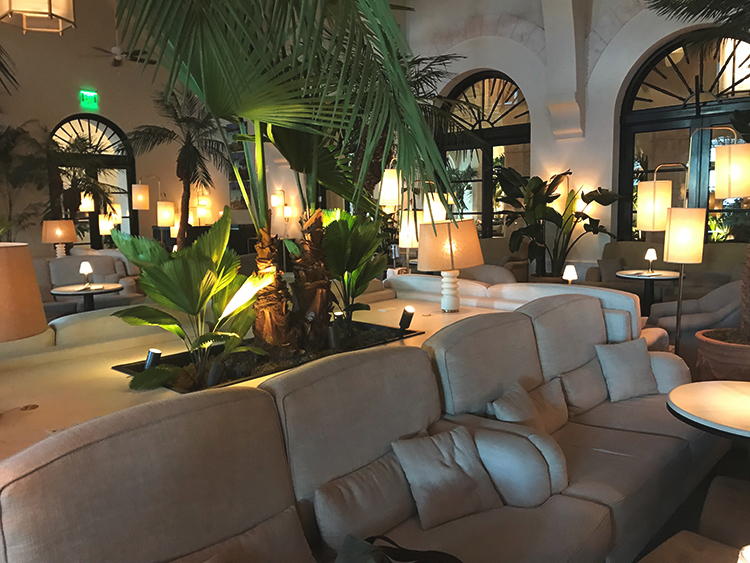 We had expected more of the pool and beach areas in terms of style, amenity and ambience, with greater reference to the spirit and style of the original club, which has been well reflected in some of the interior public areas. We consider this a missed opportunity. To plan the world’s most fabulous travels staying at the finest addresses contact us, or discover more about what distinguishes the private client services of Nota Bene.